Last week’s blog asked the question How do you decide if an employee should be paid overtime? As we showed, it depends on what and how an employee is paid, and the kind of work they do. When we explain this to our clients, they usually have some follow up questions. Below are some of the most common. Does the amount a person gets paid matter? To be deemed exempt from overtime the salary test must be passed. This test states that the employee be paid a salary more than $455 per week. This equates to about $11.40 per hour, or $23,660 per year. Anyone paid less than this must be classified as non-exempt with the exception of certain sales jobs. If an employee is paid more than $100,000 per year, which can include commissions, bonuses and other types of nondiscretionary compensation, they may be exempt from overtime but other components of the test must be satisfied to meet the exemption test. If I pay a salary, do I still have to pay overtime? In some cases, yes. Even if you pay a salary, if the job does not meet the exemption tests, you still need to pay overtime. The employee will still need to complete a timesheet or use your timekeeping system to record if they work more than 40 hours per week so that any hours over that are paid as overtime. What if the employee wants to be paid a salary and not receive overtime? While some employees perceive being paid a salary and not receiving overtime as higher status, the employee is not allowed to choose or elect to give up their rights to overtime. Even if you have them sign a waiver, the waiver will not be deemed valid. What if I change the job title? 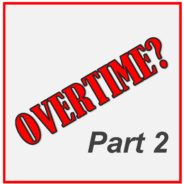 The determination whether the job is exempt from overtime is not based on the title, so changing the title to something that appears higher than the role won’t work. The determination of whether a job is exempt is based solely on job content [in addition to how and what it is paid] which means the duties of the job, its qualifications, and the amount of independent decision-making around matters of significance are what is considered. If a non-exempt employee works overtime and we have not authorized it, do we have to pay them overtime? Yes, you must still pay the overtime even if it was not authorized. You may hold the employee accountable by giving them corrective action if they did not seek prior approval, but you may not withhold the overtime. Make sure your managers are tracking time so that they can manage this behavior quickly before it becomes a pattern. Remember that your state [or even your locality] may have different overtime rules than the federal ones…you’ll need to check them to be in compliance. For complete details on these exemptions and to learn more about other exemptions, visit the US Department of Labor Wage and Hour Division website. Watch for new postings on workforce strategy here on our blog, as well as Facebook, LinkedIn, and Twitter.